Are your good intentions stressing your horse? 1. Are your good intentions stressing your horse? You don’t want your horse to have stress. You know that stress is the underlying cause of many chronic horse ailments from ulcers to insulin resistance. You want your horse to be happy. But, some of the things you may be doing to take care of your horse may be exactly the things that are causing him stress. 1. Limiting movement – Confinement causes huge stress to the horse. Horses are designed to move around all day. Their digestive tract functions much better with movement. Many times I have heard the well meaning horse owner say that their horse is too expensive to be turned out in a pasture with other horses. I totally understand the concern about an injury but the tradeoff is a stressed horse that is subject colic, ulcers and/or stall vices such as cribbing. 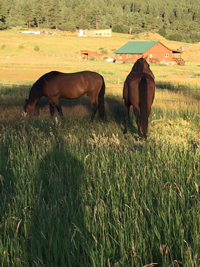 There is a huge benefit to the horse if you can find a compatible pasture mate and get your horse outside as much as possible. 2. Putting your horse on a diet – Dieting does not work any better for the horse than it does for people. As a matter of fact it can cause your horse stress which will actually make it harder for him to lose weight. Limiting food to the horse creates a signal to the horse that food is scarce and he needs to store fat. In response to this, his system will go into insulin resistance and his metabolism will slow down. Not only will your horse not lose weight but he will be at risk to increased inflammation and other negative effects of high insulin levels. He will also be miserable and hungry all the time. A much better approach to helping your horse lose weight is to find low sugar and starch hay and give him all he wants with a slow feed net system. At first he may overeat but once he realizes he has hay all the time his consumption will slow down. It is the rare horse that does not self-regulate after several weeks of free choice hay that never runs out. You will need to supplement your horse’s hay with extra nutrients that are lost when hay is cured. I prefer blue green algae for this. A tsp or 2 a day provides a whole food source of vitamins, minerals and phytonutrients such as chlorophyll. Chia seeds provide a great source of omega 3 fatty acids without causing weight gain. 1/4 to 1/2 cup will work for most horses. These whole food supplements can be sprinkled over hay or mixed with a cup or so of wet hay pellets. 3. Blanketing – Horses have the amazing ability to fluff up their hair to provide them with insulation. When you put a blanket on a horse you interfere with his natural ability to regulate his body temperature. The horse can’t take off his blanket like we take off a coat if the sun peeks out from the clouds and warms things up. When your horse gets too warm he can sweat under his blanket and this will not only stress him but he can get chilled when the temperature drops again. Unless you are going to be around to take blankets on and off with all temperature fluctuations you should not blanket. There are a few situations when you should consider a blanket. Wind and wetness will interfere with your horse’s ability to use his natural hair coat for insulation. If your horse does not have shelter then a waterproof blanket can help him stay warm if the temperature is near freezing with wind and/or moisture. Snow is not a problem as the snow will lay on top of the hair and provide extra insulation. Overheating can be a problem with the working horse with a long coat. A good solution for this is the hunter or trace clip. With this the hair is clipped along the areas of sweating along the lower neck, belly and flank area. This allows your horse to still self-regulate his temperature but allows for better cooling during work. We all want our horses to be happy and stress free. All 3 of these stresses involve treating the horse in a way that is unnatural for him. Your horse needs to be allowed to be a horse as much as possible. Don’t let your good intentions create the stress you so want to avoid. This entry was posted in General Horse Care, Horse Health Care, Newsletters and tagged horse, horse care, horses, winter horse care on December 1, 2016 by Madalyn Ward, DVM.